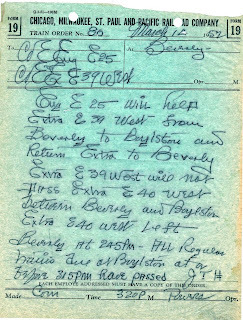 Patrick Flynn: The way I read it, the dispatcher wanted to make sure that the lite power back from Boylston (the E25) did not somehow get to Boylston AHEAD of that E40 West, and therefore on his train order authority, would be free to turn around and run east to Beverly. If the E39 has been told in this order NOT to pass that E40 West, then there's no possible LAP OF AUTHORITY, since there's no way that the helper (E25) can get to Boylston before the E40 West does. Yeah, there'd be block signals to protect a possible head on between the lite power and the E40 West (and I would hope the crews would tumble to this "trap" if the E39 West DID pass the E40 even tho we don't know if the E40 got this order somewhere else), but it would STILL BE CONSIDERED A LAP OF AUTHORITY UNDER TRAIN ORDER RULES ON ANY RAILROAD. And the DS would be held accountable for it. Rob Leachman: Patrick, the light engine E25 EASTBOUND back from Boylston will oppose the E40 WEST. I can only assume the running order for E25 eastbound from Boylston to Beverly and the meet order for E25 East to meet E40 West somewhere on the way down to Beverly were issued under a different, previous clearance. It was pretty sloppy to show different station names for the order and the clearance covering that order. Patrick Flynn: The E25 already has his authority to run extra east...lines 3 and 4. Does not need another "running order." Patrick Flynn: The order was complete at 320pm and states the E40 left Beverly at 245pm. Since the E39 has been instructed not to pass the E40 in those limits, there's no reason for a meet order between the E25 East and the E40 West. It can't happen with this order in effect. Blair Kooistra: Sigh. Why didn't they just say the hell with it and use Track Warrants????? Rob Leachman: Patrick wrote "The order was complete at 320pm and states the E40 left Beverly at 245pm. Since the E39 has been instructed not to pass the E40 in those limits, there's no reason for a meet order between the E25 East and the E40 West. It can't happen with this order in effect." I was following Allen Miller's advice and following the station name on the clearance, concluding that E25 got this order at Boylston and will run down to Beverly after which this order will take effect. 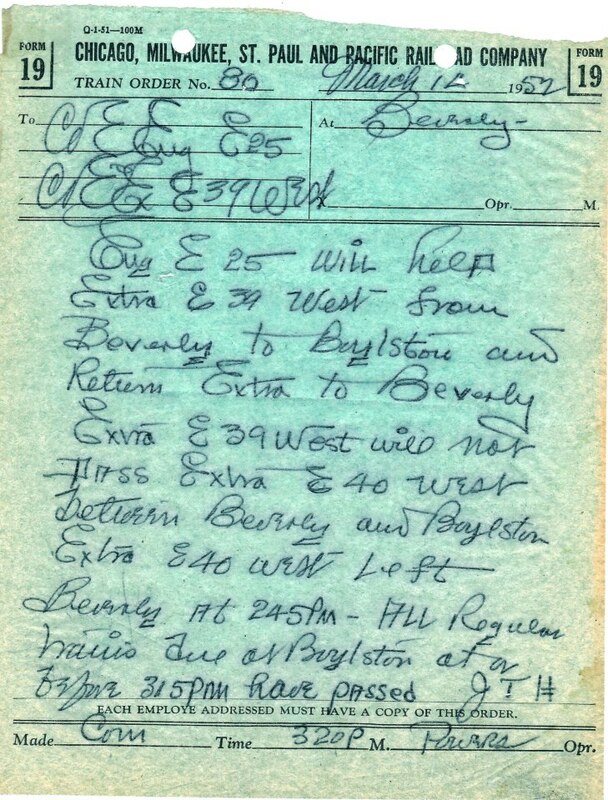 But now you provide an alternative interpretation: E25 gets this order and the clearance marked "Boylston" at Beverly, and even though the order calls for it to help E39 from Beverly to Bolyston, the clearance is at Bolyston. Your interpretation must be right. But I still think that the clearance was wrong - the clearance should have said Beverly as the station name. Allen Miller: Rob, the clearance is marked Boylston because the E25 needs rule 83B authority to leave Boylston and return to Beverly. As I stated in my previous post, the clearance should have been correctly addressed to the E25 as "C&E Extra E25 East at Boylston, care of C&E Extra E39 West" and the clearance would show being issued at Beverly. The E25 doesn't need an order to get to Boylston except the provision in the train order to help Extra E39 west Beverly to Boylston. You seem to be under the impression that the E25 was at Boylston and needed to run to Beverly to help E39 and then return to Beverly again. The helpers were based out of Beverly and the E25 was at Beverly to start with. The clearance and running order is to get him back to Beverly, light engine, after helping E39 to the summit. I'm sorry my earlier post was misinterpreted. I don't always communicate effectively, that is why I turned down offers to become a train dispatcher. Patrick Flynn: Maybe there was a special addendum in the train dispatchers' rules to permit this type of clearance card addressing? We had some amendments in the WP rules once they closed down Keddie and Greenville and we gave Highline trains (WP 4th Sub, not the GN HiLine) their "running orders" and then an "order check" via the radio anytime after passing Paxton in the Canyon and before they left CTC at Almanor (later extended to MP 38.6, then Robbers Creek and then MP 55.8). Our Rules Examiner for everyone on the WP was a former train dispatcher & chief dispatcher. And that's why his name was listed FIRST on the timetable, above even the superintendents! Rob Leachman: Yes, the "care of" was how we did it on the UP. I don't think a train order is required to dispatch an entrained helper (and I have no idea why the Milw felt compelled to put that fact in this order). We would have just issued a "care of" running order and a "care of" clearance covering the return trip. There was nothing unclear in your explanation, Allen, (and by the way I think you would have made a great disapatcher). The misinterpretation was entirely my fault.